Those who embrace the future are the ones who will shape the future. That’s a fact. You need to be ready to take on the challenges of tomorrow. You need to be future focused. But how do you cultivate that future focused mindset? Here’s the good news: you’re a valuable asset because you’re naturally innovative. However, there are likely things that are getting in the way of your innovation. You’ll need awareness about those obstacles and a road map that will allow you to navigate the future and transform that innovative spirit into an outcome-driven strategy. Join Laura Goodrich, from GWT Next, as she presents Future Focused Leadership – for innovators and change-makers like you. Are you ready to become future focused? Laura is an internationally recognized expert in change and the future of work. She has spent over 20 years as an innovator, speaker, coach, and advisor. She has been identified as a top 20 Global Thought Leader on Culture and Technology. Her global perspectives on workplace dynamics and change have earned her the reputation as someone who can create positive outcomes in even the most challenging workplace dynamics. Laura has authored, hosted, and produced over a dozen internationally distributed cinematic microlearning programs for businesses. She has hosted three television shows and a national radio program. She and her business partner are pioneer producers of cinematic microlearning programs that combine filmmaking methods, coaching, and storytelling into a designed process that drives true change. Leveraging extensive experience as an entrepreneurial technology leader and global workforce change expert, she is always looking for an innovative way to challenge the status quo. 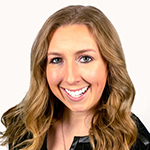 As a Marketing Specialist with BizLibrary, Katie helps facilitate and create educational and engaging webinars geared towards Human Resources and Learning and Development professionals. She conducts research and works with subject matter experts to ensure the BizLibrary audience is receiving the most relevant and up-to-date content possible.